Everyone who travels to Santorini wants to see the magnificent Santorini sunset. Which hotel could you stay in that would give you the best view though? Here's a look at the best Santorini sunset hotels to choose from. If there is one absolute ‘must do' when visiting Santorini, it's seeing the sunset. There's something magical about watching the sun disappear and the sky change colours on this beautiful Greek island. The most popular viewing spot to see the Santorini sunset is at the top of Oia, but the drawback is that hundreds of other tourists have the same idea! Finding a quiet and relaxed spot can be something of a challenge for first time visitors, which is why some people choose to stay in Santorini sunset hotels. There are four main towns to stay at along the cliffs that offer good sunset spots. These are Fira, Imerovigli, Firostafani, and Oia. In fact, if you follow my guide to walking from Fira to Oia you will pass through all of them along the way. Each one of these towns has hotels with Santorini sunset views, with some being in better locations than others. I've listed the best hotels in Santorini with sunset views below, including where to check out reviews online. It's important you do your due diligence before booking any hotel, and checking out the reviews with particular reference to the sunset is a part of this. 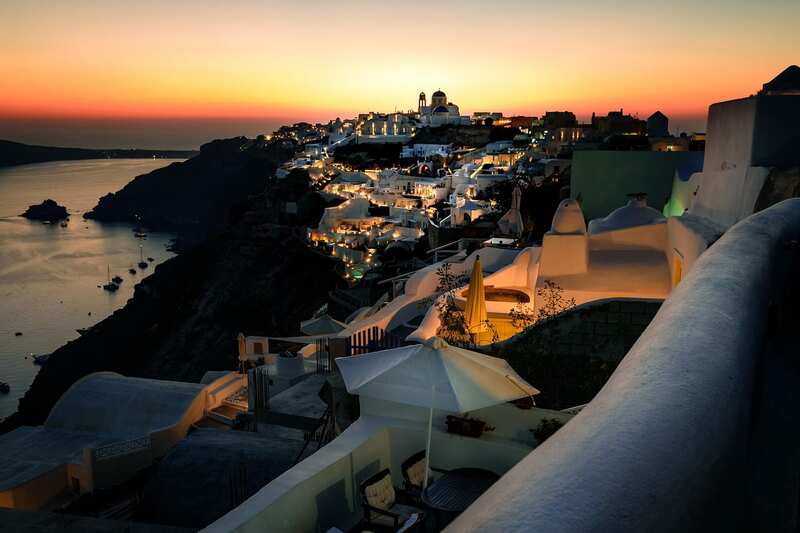 As Oia is the town that everyone heads to in order to see the sunset, you might think that every hotel offers a sunset view. This is not the case though, as the sun sets over the town which blocks out the view of the sea. This is why people flock to the tip of Oia, hence the hordes of tourists! A few hotels do offer a true Santorini sunset view, but generally speaking do not have caldera views. • Canaves Oia Suites – 95% of people rate their stay as excellent! See reviews by clicking here. • Marizan Caves & Villas Another highly rated hotel, with a 93% rating of excellent. See reviews by clicking here. • Golden Sunset Villas – – You should check out the Windmill Suite! See reviews by clicking here. Direct sunset views are not entirely possible from here, but you do get to experience a nice sunset all the same. Homeric Poems – A lovely sunset experience. Can get booked well in advance during peak season! See reviews by clicking here. Hotel Keti – Good accommodation with a reasonable price. See reviews by clicking here. Porto Fira Suites – Located on the edge of the caldera, and guest comment about the wonderful sunset. See reviews by clicking here. Although it might not have the high profile of the two main towns on Santorini, Imervovigli does in fact have some of the best sunset spots. 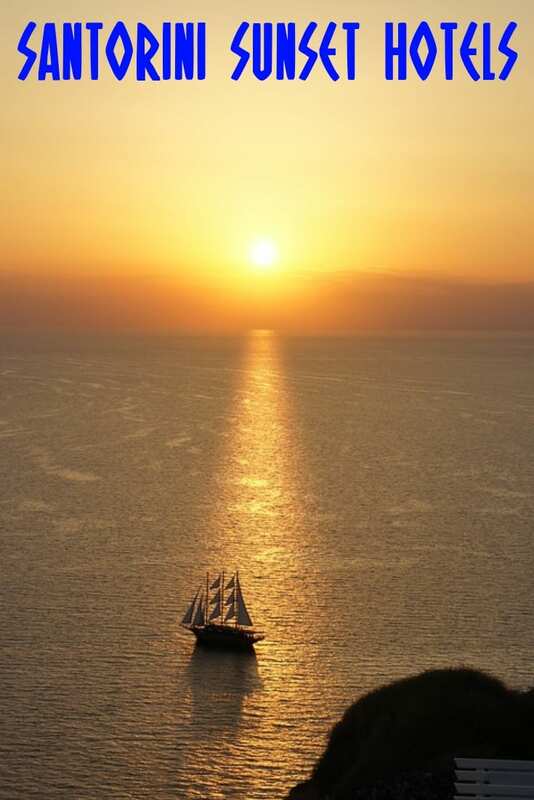 This means that when it comes to looking for a Santorini sunset hotel, Imerovigli makes a very good choice. 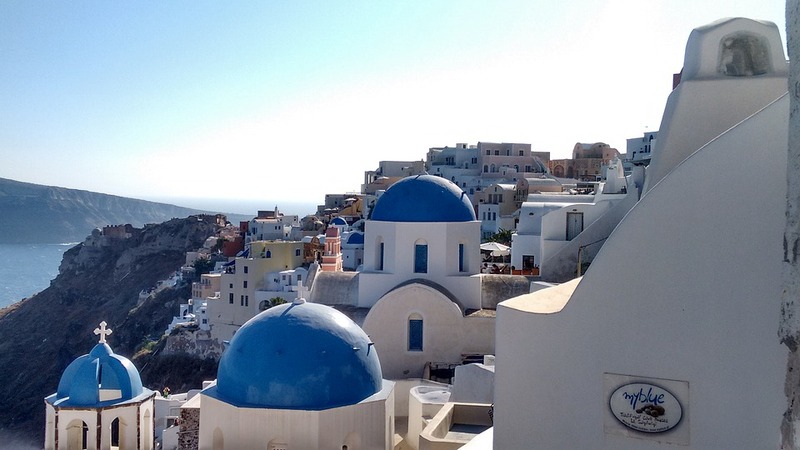 • Grace Santorini – Champagne breakfast, plunge pool, and sunset views? Yes please! See reviews by clicking here. • Absolute Bliss – Breathtaking location and a honeymoon suite. See reviews by clicking here. 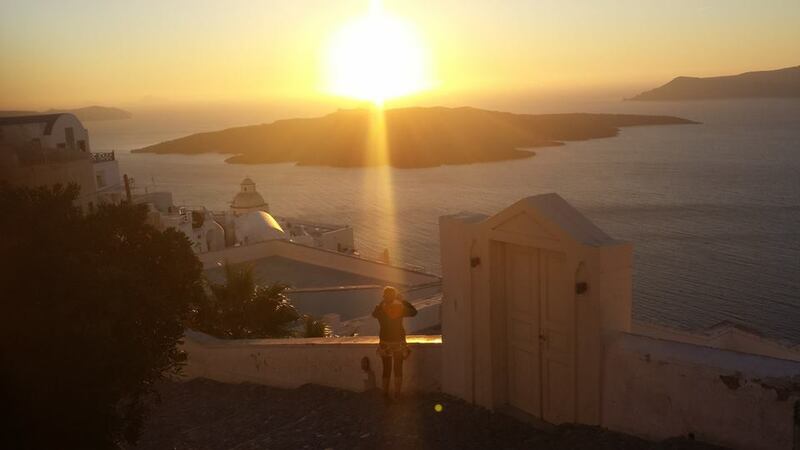 There's plenty to see and do on Santorini apart from the sunset of course! I've got a great guide here which acts as an introduction on what to see and do in Santorini. There's another one here on Red Beach Santorini. For more free travel guides on Santorini and Greece, sign up for my newsletter where I share the best of the best from the blog with you! Firstly, thank you I have been reading your guides and they have been super helpful.Based on what I have read this is the itienary I have prepared for my visit to Greece in May this year. Is there anything you would change about it? Your itinerary looks really good! My only thoughts might be to cut back on one night in Santorini,and perhaps add an extra in Milos. However, I don’t think it really matters, as you have a great trip planned here! If you’ve yet to book your accommodation, I’d love it if you could go through the links on this page. I’d get a small commission, and it won’t cost you a thing extra. Enjoy your trip to Santorini and Greece! Hi. I’m a solo tourist (73 yrs young) and am looking for a quiet cheapish family run hotel (possibly). As I want to see as much as possible of the island, as well as sailing trips to the caldera, where would you recommend I stay on the island. Price wise – a lot depends on which month you visit, as even affordable place have double prices in July and August for example.